I’m halfway through the summer session and I’ve absolutely loved my topic for the last two weeks! 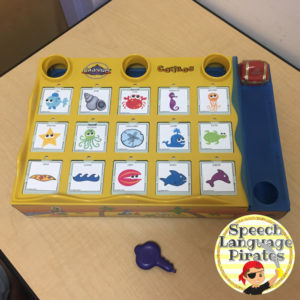 I work with preschoolers with a wide range of abilities. Some are using communication devices while others are working on using subject pronouns. I was able to carry this same theme for a whole two weeks. I’m guessing you probably already own at least some of the same therapy materials that I used this week! I didn’t realize how many toys I had already in my closet that were perfect companions to this story! As we read the book, I asked students to label the animal on each page. Then I asked “Where does the (animal) live?” A choice on the iPad was “in the ocean”. Then they requested a fishing rod so they could find that same animal on this fun magnetic puzzle. Nearly all of the animals are represented in both the book and the puzzle! At the beginning of the summer, I found this adorable stuffed pelican. He comes with 4 different sea creatures to eat. 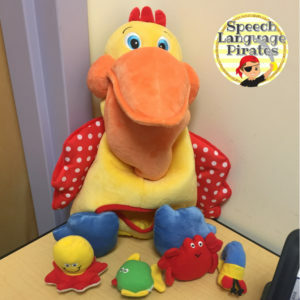 All of the pieces have some sort of sensory aspect to them: crinkle noises, a rattle, etc. 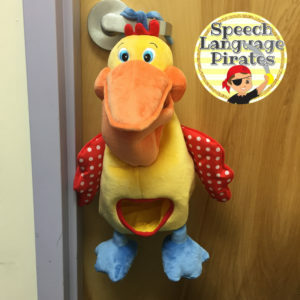 Students can see the creatures go from his mouth into his belly, then take them out and feed him over and over. 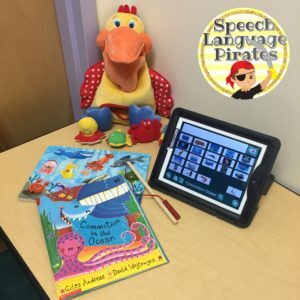 My students used verbal language or their communication devices to combine words and expand utterances: “eat crab”, “pelican eat fish”, “open mouth”, etc. 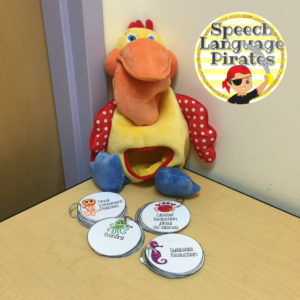 For my phonology students, I made these cards that target some of my most common phonological process goals and paired them with the pelican toy. 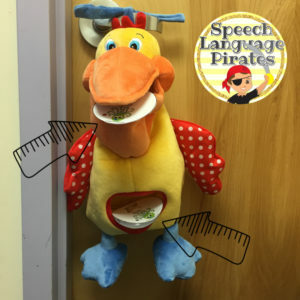 I tied the pelican to my door handle using the ties on the top of his head. 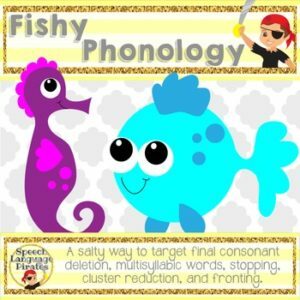 After producing each word, they fed the card to the hungry pelican. They loved seeing the cards go down into his belly. We finished up the unit by playing Cariboo. 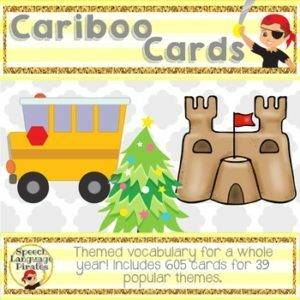 I used pictures from Cariboo Cards: Themed Vocabulary for a Whole Year. The animals pictured, again, lined up perfectly with the book! 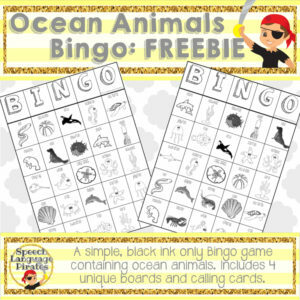 Here’s a fun ocean animals bingo freebie I made, also! If you’re lucky enough to get the summer off – enjoy! 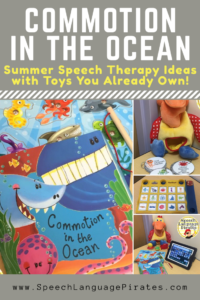 If not, I hope you can use some of these ideas for your therapy plans! That pelican is way too cute! I love how you made cards for him to eat. Great thinking! 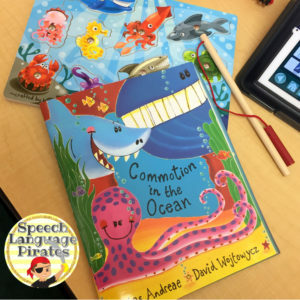 Try the little shark song! It is simply amazing. I’d love to hear more about this! Is it a YouTube video?? ?